DIY NailArts: 3. French nails with a twist! 3. French nails with a twist! It being a Saturday, so, its a nail art day!! Today I have come up with an art for the people who love French nails and sparkle arts at the same time. French nails with a Twist! 3. Apply the sparkle nail paint as you do in French manicure i.e. make a vertical line as a boundary of nail paint, then apply paint above the surface of that boundary. Make sure you dab the sparkle paint so that it spreads equally in all directions. To learn how, have a look at the video. 5. After the art is done, let it dry. Then put a thick layer of transparent nail paint on your nails to safeguard your art. 7. Your nails are now more beautiful than ever! 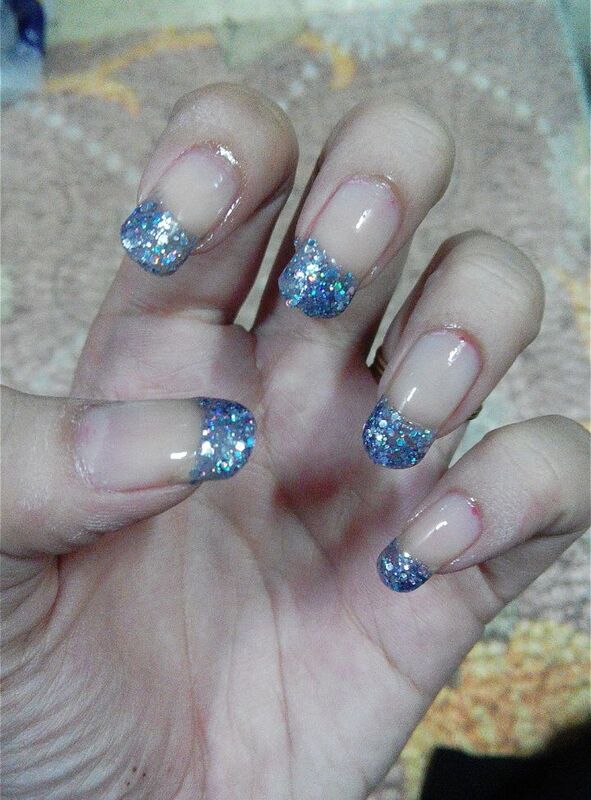 The nail art looks simple yet elegant! What do you think? If you liked this art, please stay tuned for my next art on next Saturday. Comment your reviews on. You may also follow me on facebook Jyotsna Nail Arts. Nail art kit and nail paints. 1. The power of Sparkle!